Description: This is my first sighting of two of these EMD Tier II's lashed up. They are waiting at Neptune Street. Description: SD70M-2 #2741 sits second in line. Description: NS 144 heads North at CP-79 on the Marion Branch with a pair of SD7-M-2's. Title: A loaded coal train by the Shellburne Falls Trolley Museum, and the W.F.P.T. picnic as well. Description: The weather was nice, but over 2 days, this was the only daylight train at out cookout. The 2741 was the only unit on line with 90 coal loads. Description: 21J rounds the bend heading towards the Allegheny Tunnel. 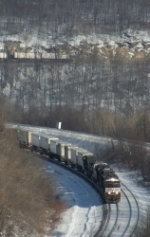 Description: Pair of SD70M-2's haul NS stacktrain 24V eastbound on the controlled siding on the Lehigh Line. Description: NS 312 ariives CP-78 on the Marion Branch nearing the end of there journey from Elkhart. Description: 312 has turned onto the NS Red Key from the Marion Branch just east of CP-79. Description: 312 runs eastbound on the NS Red Key south siding coming off of the Marion Branch at CP-79. Description: 312 pulls up to 33rd st on the NS Red Key south Siding preparing to stop to run around there train before heading west to Goodman Yards. Description: NS 312 slowly pulls up to 33rd st. preparing to stop on the Red Key south siding to run around there train before heading to Goodman yards. Description: Interchange with the Black River & Western, 1425 hours. Description: NS 21Z heads west toward Elkhart on track 1 on the ex Conrail Chicago line. (Note the workers on the water tower). Description: NS 21Z heads west toward Elkhart on track 1 on the ex Conrail Chicago line. Description: 21Z heads west on track 1 on the ex NYC NS Chicago line. Description: Stored former Conrail GP38s at the Juniata Locomotive Shop. Description: CP 23T sits on main 1 after going into emergency, nothing was wrong. Description: 21M heads west behind an M2 trio, now viewing trains up at the bridge again.